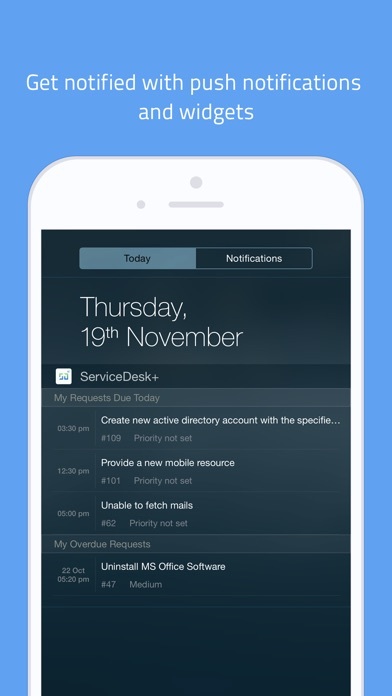 The IT help desk software trusted by 100,000+ service desks world wide The right help desk app for you - The ticketing functionality of the ServiceDesk Plus mobile app is Pink verified. 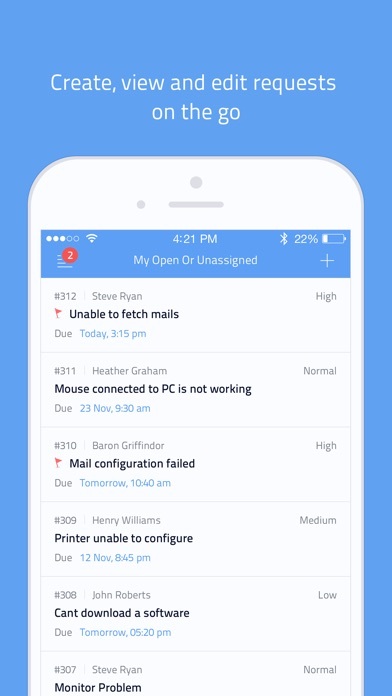 So you can access best in class features to manage your IT help desk. 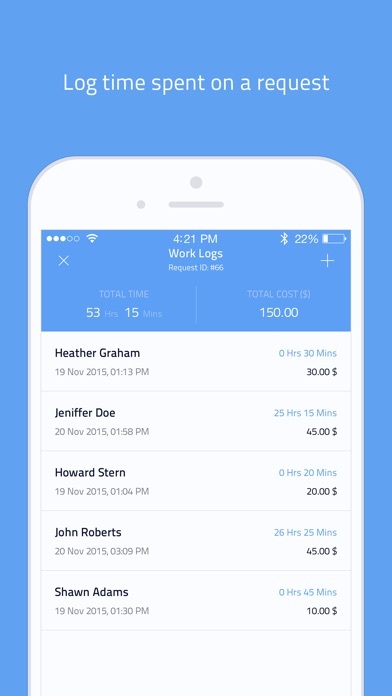 - This is the only Voice based app in the IT help desk industry Manage your IT help desk tickets on the go - Create, manage, and close help desk tickets - Add subject, description, attachments, resolutions, tasks, worklogs, and notes - Take a picture from your phone and automatically add as attachments to the tickets - View all the details of your ticket including conversations in a single pane - Edit, pick up, assign, close, delete, and reply to tickets - Get important ticket updates as push notifications Get custom views of your tickets - Choose from a wide variety of default views like All tickets, Open tickets, Assigned to me, etc. - Create custom views for faster access to tickets that matter - See response and resolution SLA status flags in the request list view screen Help end users contact the help desk anytime from anywhere - Enable end users to raise tickets from the mobile app in minutes - Get end user contact information from within the help desk ticket Streamline help desk tasks - Add tasks to be associated with help desk tickets - View, edit, and delete tasks as needed - Assign tasks to technicians for clear ownership - Mark scheduled and actual start and end times to keep track of schedule compliance What Customers Say ManageEngine ServiceDesk Plus is really easy to use and our goal for getting people to use the system has become more attainable. - Chris Joyner, User Support Manager, UNC Asheville ServiceDesk Plus is an excellent product. We simply love the dashboard as it allows us to keep a watch on the tickets and quickly provides useful information. - Darren Hammond, ICT Manager, Lesedi Nuclear Services To try the demo of the mobile app , install it on your phone and use the following credentials to login. 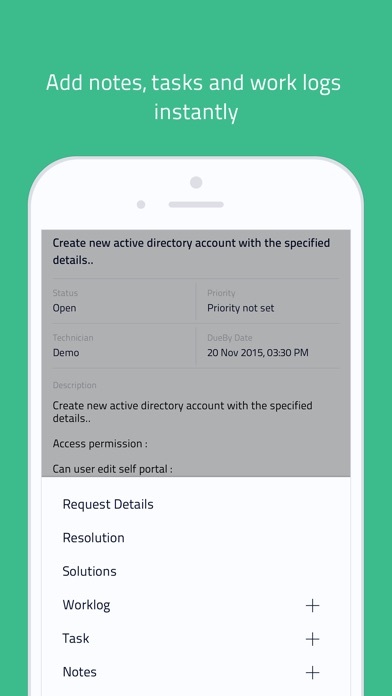 Username: demo Password : demo Note: This is not a standalone application. 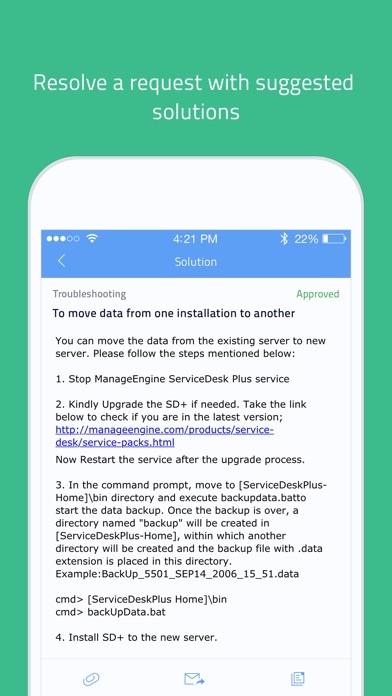 To log in, you must have downloaded and installed ServiceDesk Plus app or have an account with ServiceDesk Plus. Everytime they update this software it always crashes! LAME! After updating app. Crashing. This is very vital for myself and my company. Need fix. I like the push notifications and the ability to have access to all of my tickets from my phone. However, the lists of tickets would be much more helpful if we could sort them by other fields such as priority or due date. Also, the color codes for priorities along with other misc icons (approval, overdue, etc) would be nice to see from the list as well. Some of the features of the main system need to be included as well, such as the closure codes and FCR check boxes when we close a ticket. Also, the Asset portion of the app will let you search the asset, but will not show any details about it. There is no (obvious) option to login with AD credentials. As a result, I can’t even login using this app. 3/6/18 - Contacted them per their response...never heard back from them. UPDATE: Everything works with the newest version now. The new release has broken the close button on the resolution screen searching solutions from the main screen also yields no results. You have to go into a ticket and search Solutions there to be able to see them. The recent update doesn’t fix the data loading in the widget for me. It just says “loading”. Also, screen is not optimized for the iPhone X. Please fix issues. Keeps popping up invalid JSON when trying to pull up any request details. I have tried several times. Keep getting a JSON error. Sent email to support no response. I am using the a valuation coffee and I can't see my way clear to buying this product if I can get it to work and I can't get any kind of support. My app updated to the Jun 16, 2016 build and now I can't log into my ticket server.